Muther (left) and Icelandair flight attendant Páll Magnús Gudjónsson. REYKJAVIK — I was trying very hard not to be that kind of American. The one who travels to a foreign land and spends his time looking for Starbucks and Kentucky Fried Chicken while complaining that street names are not in English. But my limits were being tested, and just like high school calculus, I was about to fail. “How about the whale, puffin, and langoustine mini burgers?” asked Páll Magnús Gudjónsson, searching my face for an answer as a waiter politely hovered, ready to take our order. How could I possibly consume a meal that sounded like the cast of a forthcoming Pixar film? Perhaps I could claim a deadly allergy to puffin mini burgers? Sensing my discomfort, Gudjónsson changed the order to a starter of minke whale steak. I requested a glass of wine. If I was going to free Willy from my fork and into my mouth, I’d need a bit of liquid courage. I was aware that puffin and whale were common fare on Icelandic menus, but on previous trips I didn’t feel compelled to try them. This time, however, I was traveling with a local who had taken on the job of showing me the food scene. Earlier this year Icelandair introduced its Stopover Buddy Service. It’s a first-of-its-kind program where travelers can request to be paired with an employee of the airline to get a perspective of the country that is impossible on a bus with 50 other tourists. The program is on hiatus for the summer and returns in the fall, but there were more than 700 requests for buddies in its first few months. Gudjónsson, who works in the Icelandair cabin crew, was my Stopover Buddy. I requested a food experience for my Reykjavik trip. Other buddy options included lifestyle, nature, health, culture, and adventure. But honestly, doesn’t restaurant hopping sound like more fun that ice climbing? I had visions of being seated at prime tables in some of Reykjavik’s toniest boites. Buddies are based on availability and aren’t guaranteed, but if you get one, you could wind up exploring a part of the island country with anyone from a baggage handler to the CEO of the company. There’s no cost for the buddy, but you are required to pay for your own food, museum admission fees, gear rental, or any other expenses involved in your excursions. Before the trip, Gudjónsson sent me an itinerary. I initially found it difficult to disengage myself from the planning process and I immediately started suggesting changes. Lots of changes. Then I recalled that the entire purpose of the program was to rely on his expertise, not for me to dictate the agenda. I took a deep breath and put my faith in him, even if it might involve eating adorable seabirds and aquatic mammals. 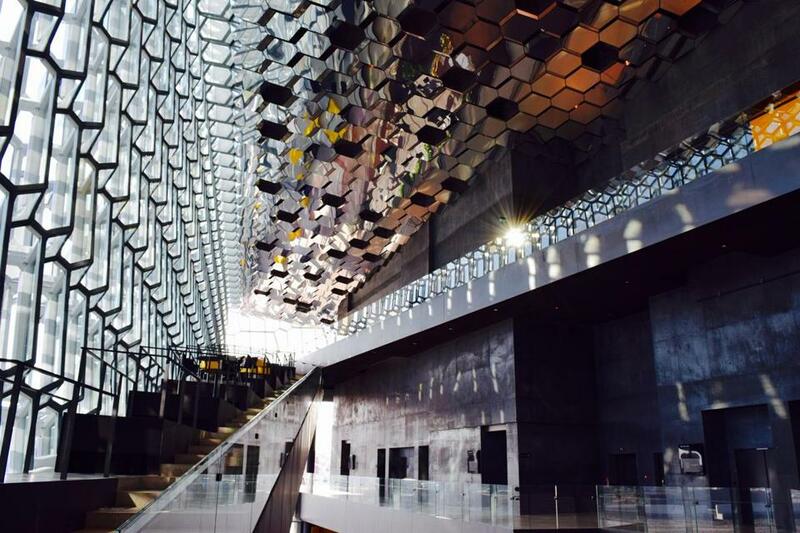 The interior of the Harpa concert hall in Reykjavik. I met up with Gudjónsson, who towered over me the way most Nordic gentleman do, and I began to worry. We started our weekend by visiting two buildings that are on every tourist’s list: Perlan and Harpa. Perlan is a giant saucer-shaped building outside the city center that looks like a Barbarella-era spaceship. Harpa is the stunning, modern glass concert hall built as the country teetered on the edge of economic collapse in 2008. These would not have been my first choice. I wanted to see what the locals see, not visit tourist mainstays. Even though our plan for the next day didn’t seem to involve a lot of food, I was optimistic because we were exploring a part of the country I had never seen — Vestmannaeyjar (we’ll stick to the anglicized pronunciation of the Westman Islands). Westman is an archipelago of 15 islands (or more, depending on whom you ask) off the south coast, about 30 minutes by ferry. Only one of the 15 islands, Heimaey, is inhabited. Gudjónsson grew up on Heimaey, worked on the ferry as a teen, and I’m pretty sure still knows everyone who lives there. When we were having lunch at Gott, which he swears is his favorite restaurant, most of the population of the island came over to say hi. Heimaey, along with the rest of the Westman Islands, is the kind of place where you could be very content parking yourself on a blanket for a day and looking at the volcano-sculpted scenery. Imagine a Winslow Homer painting of a sweeping hillside, but instead of being set in Maine, it was set on a dramatic island created out of lava in the North Atlantic. That’s what the Westman Islands look like. 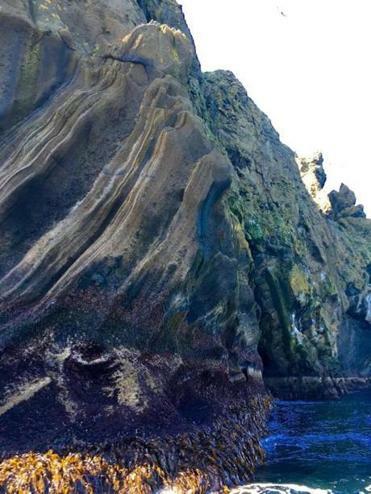 The precarious cliffs and turrents of rock that crop out of the ocean all appear as if they were created from CGI, because nothing in real life ever looked so gorgeous. It was a peaceful, quiet, and idyllic day to be lollygagging around. This is the part of the story where I confess that I was completely smitten with the islands because the weather was exceedingly cooperative. On previous visits to Iceland I’d spend my time with a nasty case of hat head and a face stinging red from windburn. But this time there was no wind, the sun shone constantly, and the temperature soared to 52 splendid degrees. 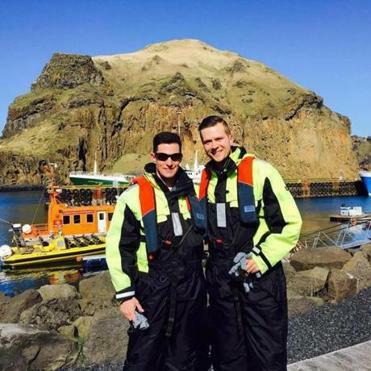 The only stinging wind to be had was when I donned an insulated, water-proof jumpsuit for a 25-mile-an-hour (and occasionally much faster) open air boat trip around six of the Westman Islands and inside several of the sea caves. The tour guide told an appropriate number of salty jokes while pointing where cannonballs struck the steep cliffs during the Turkish invasion of 1627 and the puffins, who were just returning to the island for the summer. The captain, who I’d estimate to be somewhere in his 50s, began regaling us with tales of summer puffin hunting in his youth. Hunters pulled in thousands of the adorable one-pound, orange beaked birds annually. My mouth dropped open at this news, until I realized it was filling with ocean water as we sped around the iceland of Álsey. “Have you ever tasted puffin eggs?” the captain asked. Dear Lord, had I unknowingly eaten puffin eggs at breakfast? Those big puffin hunts are now a thing of the past. The population has dwindled as the puffin’s food supply has migrated north. It wasn’t the hunts that drove down the population, it’s the warming ocean. The situation was so serious that hunting, once a major sport here, was banned in 2011 and 2012. Last year restrictions were lifted and a three-day hunt was allowed. The Westman Islands off the Southern Coast of Iceland. I now had an excuse not to eat puffin. If the Westman Islands, or perhaps Heimaey, sounds familiar it’s because a volcano erupted here in 1973, displacing the island’s 5,300 inhabitants. I could yammer on about it, because the history of how the lava was slowed is fascinating, but you’re smarter getting off your duff and visiting the island yourself to get a first-hand account at the modern Elderheimar Museum . If you do go to the Westman Islands, you should plan your trip in August to coincide with the Westman Islands music festival. The islands’ population grows from 4,000 to 16,000 for the weekend event. It’s also the only music festival I know of that begins with an official “hook-up” night. No Tinder necessary. After a day on the Westman Islands I was much less concerned with culinary adventures. Little could live up to the experience of zooming around in the ocean on a boat that I think was a giant inflatable raft with a motor, or the surprise of warm sunshine and otherworldly views. But Gudjónsson made good on his foodie promise the following day at Matur Og Drykkur. The restaurant is known for reinventing and modernizing traditional Icelandic recipes. I hadn’t had an Icelandic hot dog during my stop over. Gudjónsson was slightly aghast when I suggested a hot dog earlier in the trip, informing me that only tourists eat them. But the menu at Matur Og Drykkur featured a gourmet version of the country’s famous dog. I contemplated something less conventional, like cod tongues in orly, but decided a hot dog made of lamb was very Icelandic. It may not have been as traditional as a puffin mini burger or whale steak, but I felt far less criminal eating it.